Well, when I say "South Indian style", I really mean "my mother's style", but it's not far off the truth as descriptions go - I mean, my mother IS South Indian, and it IS her style. Heh. I'll also say this - spinach cooked this way is probably an acquired taste unless you REALLY love the taste. I quite like spinach, plus I've acquired the taste, so I face no problems whatsoever! 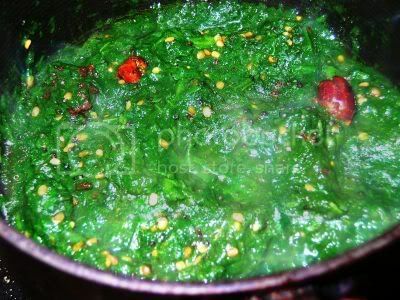 Ideally, the two ingredients that would make this completely authentic are: 1. mor molagai - green chillies that have been soaked in salt and buttermilk (dont know the recipe myself - and not likely to make it either, because of a lack of strong sunshine in these here parts...) and sundried. These are fried in oil and sometimes used to season certain dishes, but more usually eaten as an accompaniment with yogurt and rice, rather like appalam/poppadum. 2. Karuvadam - these are usually made with pumpkin and spiced up with red chillies. I dont know what else goes into the recipe, but again, they are dried in the sun and stored away. 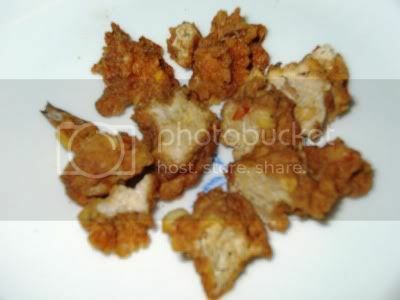 They make their appearance occasionally, fried and added to certain dishes - like keerai. I'm not sure if karuvadam have any equivalent in western cuisine, so I dont have a comparable to explain with. They're very intense in flavour, so a little goes a long way. Of the two items, I had the karuvadam - a small stash which I used up boldly in the certain knowledge that I will be replenishing my stock very soon on my India trip! 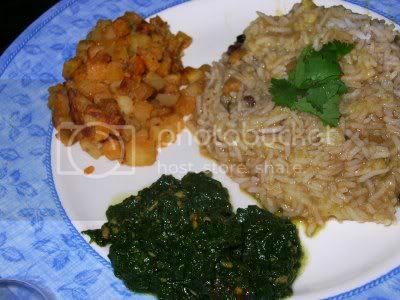 Keerai made this way is a classic accompaniment for vattha kuzhambu and rice. I had an added extra - simple pan-fried potatoes. Oh by the way... keerai can be made without the karuvadam, too. They arent essential, just a tasty extra. 2-3 dry red chillies - or 4-5 mor molagai pieces, if you be so lucky as to have them! 1. Cook the keerai with 3-4 tbsp water in a closed pan till wilted. Let it cool. You can now mash it for a robust texture or run it in the blender a couple of times till it's pureed. I prefer an in-between texture - not too rough but not completely smooth, either. 2. Put the keerai back in the pan along with salt to taste, and let it simmer on low along with 1/3 cup water. 3. Heat the vegetable oil in a small pan and fry the karuvadam and mor molagai (if using). Remove from oil and set aside for the moment. 4. Spoon out most of the remaining oil, leaving about a tsp in the pan. Add the asafoetida, mustard seeds, urad dal and the dry red chillies. Cover the pan and let the seeds splutter and the urad dal turns light brown. 5. Pour this seasoning directly on the keerai and mix well. Add the karuvadam and turn the heat off. Pour the tsp of coconut oil over the keerai and mix again. Serve hot as a side dish with vattha kuzhambu and rice. AK, you've gotta get used to leaving out the chillies from my recipes if you dont like them :) But I like a bit of heat, me. Lucky you, Sailu... home-made ones are the best! Priyamvada - yep, I think there's a bit of confusion about vadams in general... what's vadam in one household becomes vatthal in another, for instance.